Bay Beach 3bd Cottage. Walk To Beach And Jitney! Summer is Coming! Enjoy days at the beaches and vineyards, lazy afternoons in the hammock and dinner under the stars by the firepit. This cute little cottage is just a short stroll down to Veteran's Beach. 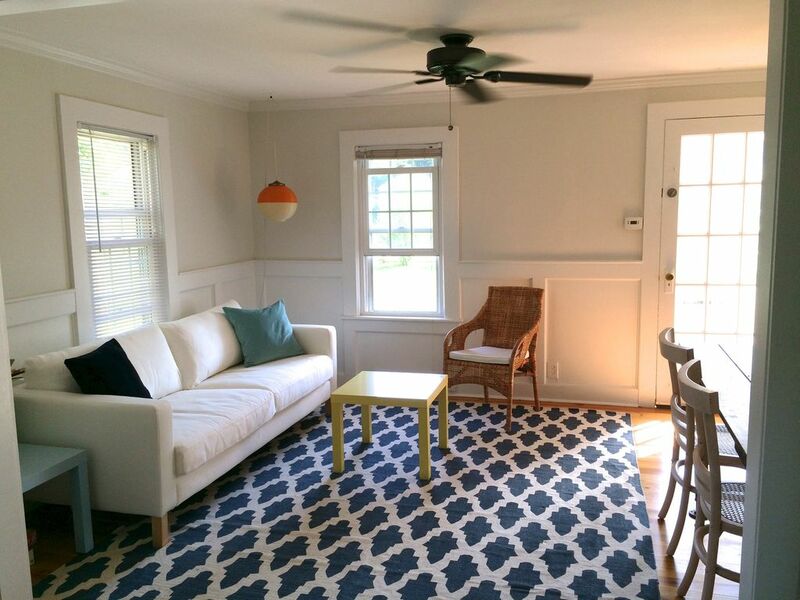 Our bright and airy cottage is minutes to Love Lane, countless wineries and farm stands. The kitchen is stocked and ready to cook up your farm stand bounty. In the living room there is a table to accommodate dining for 6 and a flat screen smart TV with Netflix, Hulu, etc. The 3 season porch off the living room is the perfect place to watch rainstorms or read a book. On the first floor there are two bedrooms with queen size beds. Up the stairs is a private loft bedroom with two twin beds that can be made up as a king. Washer and Dryer in the basement. House sleeps 6, accommodations for up to 8 people may be available for an additional charge. Within walking distance to beach, Jitney, tennis courts, grocery store, movie theater, CVS, Starbucks. Close to Love Lane with all its charming shops, Love Lane Kitchen, and Lombardi's, Good Food and The Village Cheese Shop. Come relax and enjoy all the North Fork has to offer! Please note, there is small studio at the rear of the property where the owners stay from time to time. It is separated from the house by landscaping, so you have your privacy, but the driveway is shared. For ideas on how to tour the North Fork without a car, read here! picnic table with umbrella, hammock, badminton, 4 adirondack chairs and fire pit. beach towels, 4 beach chairs, beach umbrella provided. badminton set provided, baseball and 2 gloves provided. Had a wonderful little getaway to the North Fork. The owner, Amanda was easy to contact, quick to answer any questions we had. The beds were very comfortable. The property was perfect for our needs, our dogs were in heaven. Close to the bay, and some fabulous restaurants We ate at a few , CJs , and A Mano. Loved, loved the food! Delish. We did a few wineries, the cheese shop and some close towns exploration. The neighborhood was quiet, the stars so crisp at night. The kitchen had everything you need. It's not an expensive place, but it is cozy, quaint and clean..We will surely keep this place in mind for a return visit. So much better than staying at a hotel. A perfect house for a long weekend on the North Fork. The house has everything you need to entertain and relax! I was impressed with the organization of all the amenities, including a welcome binder, a variety of ‘lawn games’, and extra blankets. The location is super close to the Bay (beach!) and Love Lane. I didn’t use the loft space, but it can very easily fit adults. I would definitely stay here again. Thanks!! Cozy little cottage with a big and lovely garden. We had a good time and enjoyed having breakfast and dinner in the garden. The town and surroundings are gorgeous, wineries are a must do and visit to the local farms to buy fresh eggs as well! The cottage itself was net and clean, as pictured. The lounge area was smaller than I thought, it was ok as the weather was nice so we were outside most of the time. We stayed in the Bay Beach Cottage for a long weekend with my family. The house has everything you need for cooking in the kitchen, grilling, hanging in the backyard, or visiting the beach. I appreciated how simply the home was decorated, while still providing everything you might need in terms of linens, bedding, etc. It is a convenient walk to the beach, as well and the downtown area of Mattituck. We would definitely rent again if staying in the area. Rates are subject to change until reservation is confirmed. Payment is refundable with more than 30 days notice. Full return policy described on lease. Rental payment is due in full at time of reservation either by check or through Book it Now. Security deposit and cleaning fee are not due at time of booking unless booking is within 30 days of entry. Those fees can be made in the same manner as the rental payment or they may be sent later by personal check. Security deposit is $200. Pets will be considered. If approved, an additional deposit of $200 will be necessary. There is a minimum renter age of 27.